Everyone goes to The Metropolitan Museum of Art. Tourists know about it. The most annoying tourists, actually, even those guys…they still know about it. So why should The Met be on The Anti Tourist? The answer is easy: a ghost. A friend of mine, whose name will remain undisclosed as per the tacit agreement I have with my friends to not get them fired while pursuing my adventurous journalistic endeavors, works at The Met. He has been bugging me for years to let him take me on a private tour of the place. I finally caved and did it last week. The paintings were great. The furniture, the artifacts, the mummies…yeah yeah. It was all highly entertaining. But the best part was when I got to the Luce Center for the study of American Art in the Mezzanine. My friend and his fellow colleague proceeded to tell me about the little girl who was once a daughter of a worker at the museum who haunts that floor. One hall in particular, the one pictured, is where they say people often complain that they hear her footsteps, her giggling, and her talking. 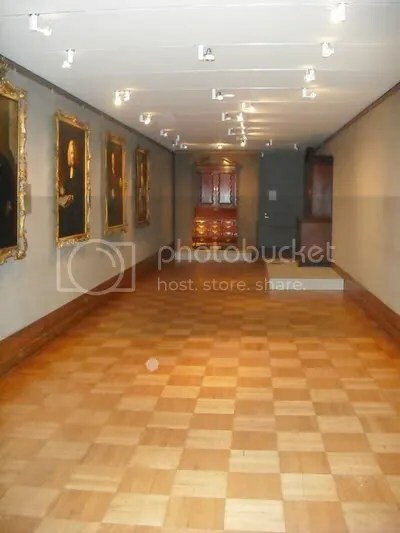 So if you’re stuck going to a big touristy spot like The Metropolitan Museum of Art, why not make your way into a section not quite listed in the directory: The Haunted Section. Next > Sixth & I Historic Synagogue: Far from your average temple. There is an orb, after all. Stumbled upon this post after searching for Met hauntings. I recently was there at the museum photographing the house facade in the courtyard. when reviewing the pictures later I noticed a face in one of the windows on the 2nd floor that wasn’t there before.It cannot be a reflection or someone behind the glass. There is no explanation for the photo other than…ghost! But not of a little girl. This figure appears to be male and from the 18th century. No evidence seems to exist to support my photo but no matter how I alter it or zoom in, the face stays the same. Maybe the face belongs to a spirit connected to something in the American Wing….who knows!